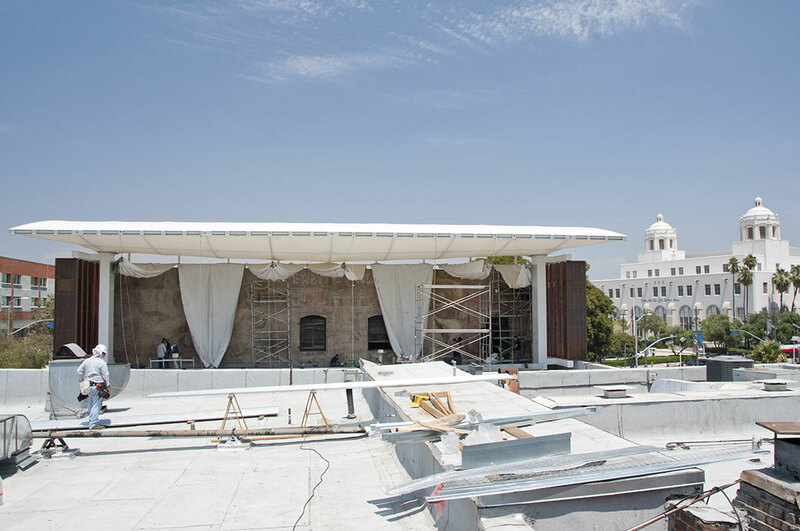 The protective shelter for América Tropical consists of a wrapped steel framed canopy that projects out to protect the mural from the intense Southern California sun and occasional rain. Free standing, angled side panels on both Main Street and Olvera Street provide additional protection. Together, the shelter and panels help protect the mural from sun, wind, rain, birds, and air pollution. The mural with its protective canopy during the final phase of conservation. A roll-down screen protects América Tropical from direct sunlight, rain, and other damage when not open for viewing. Photo: Stacey Rain Strickler. Mural: © 2012 Artists Rights Society (ARS), New York/SOMAAP, Mexico City. In addition, a roll-down screen has been installed in front of the mural wall. This screen, which can be lowered to cover the mural when it is not open for public viewing, provides an additional layer of protection to the mural. The viewing platform, accessible by elevator or stairs through the América Tropical Interpretive Center, located in the Sepulveda House, provides the public with access to the mural for the first time since the 1930s. The design for the shelter and the viewing platform, by Los Angeles-based Brooks + Scarpa, went through a public approval process prior to construction. Its contemporary design takes into consideration the historic streetscape in which the mural is located. The colors and textures of the shelter reference the historic architecture of Olvera Street and El Pueblo de Los Angeles Historical Monument. The engineering challenges included the need to support the structure independently of the historic Italian Hall on which the mural is painted, offer an unobstructed view of the mural from the viewing platform, and span the archeologically significant Zanja Madre (Mother Ditch), the first aqueduct to be built when the pueblo of Los Angeles was established in the late eighteenth century, which runs across a corner of the building's basement below the mural.